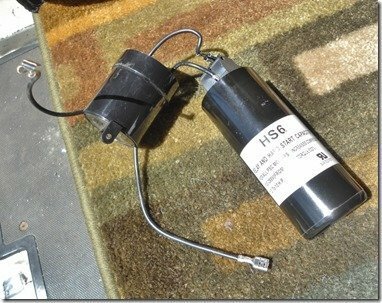 Why do I want a Hard Start Capacitor? 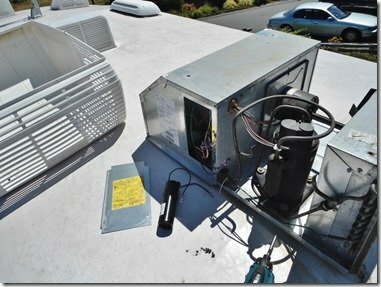 When dry camping there are times I would like to run the roof-top air conditioner to cool the camper down. I have a pair of Champion 2000w inverter type generators that I can parallel together for 4000 peak watts and 3200 continuous watts of power. They normally can power the AC fine except when the temps and humidity climb and it gets really hot, like above 95F. 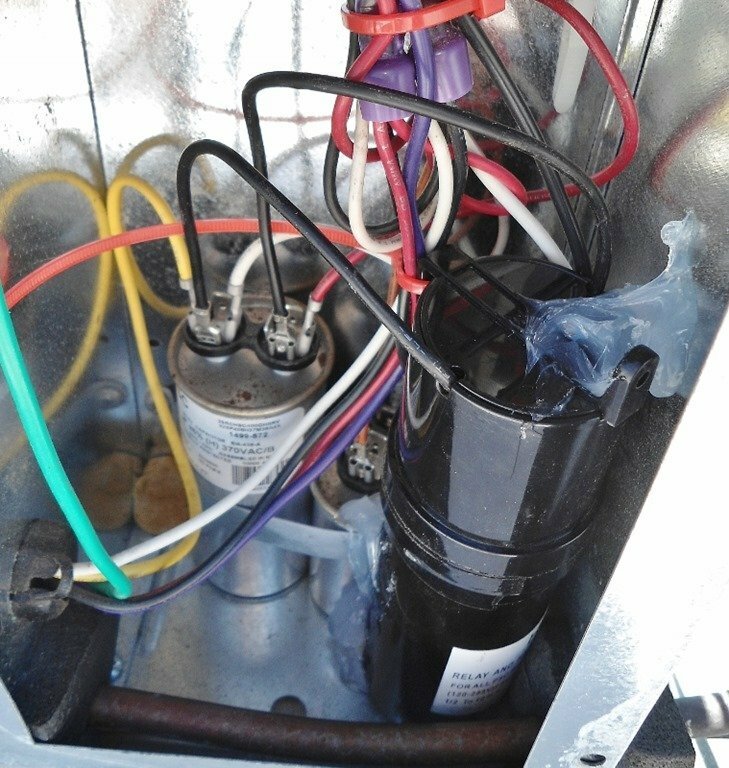 In these conditions, the AC’s compressor needs more current to start and will cause even the two paralleled generators to overload, especially if we have a few other things running and also drawing some current in the trailer. While researching a solution, I came upon many forum threads and blog posts expounding the virtues of installing a hard start capacitor kit. Researching it a little more I discovered my RV’s roof-top air conditioner didn’t have the hard start kit, but one could be easily installed. I decided to get a hold of the hard start kit and give it a whirl. 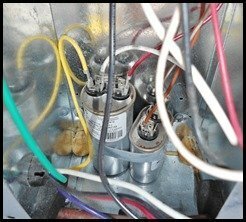 What Model AC do I have? 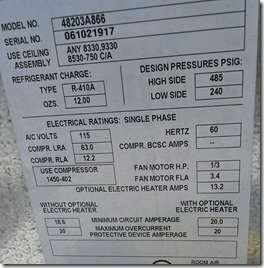 My Keystone Cougar 276RLSWE Fifth Wheel trailer came equipped with an AirXcel 48203A866 Air Conditioning system utilizing the Coleman Mach III rooftop AC unit. The particular model installed does not have the optional hard start kit. If you look at the schematic (photo below) from my units sheet metal cover you can see the dotted lines where it can be installed. Where did I get the hard start kit? Seeing that my unit can utilize a hard start kit which consists of an electrolytic capacitor and a PTCR device plus hook-up wires I searched around for one. Not having much luck with local stores and being in Canada ordering from the US can be a pain. I picked one up off a supplier on EBay for around 15 bucks including shipping. One of the mysteries of modern trade, stuff gets shipped easier and cheaper from China to Canada than right next door in the US. *shrug*. If you’re in the US you can order the part off Amazon for a similar price. Great question, a PTCR stands for Positive Temperature Coefficient Resistor. Here is a link to a full explanation but the main thing it does in the circuit is to allow a boost of current to the compressor when it first starts up and then the PTCR heats up and changes it’s resistance to close off the extra current because it is no longer required. 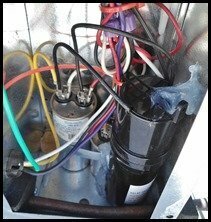 The compressor only needs that extra juice to get started, after that the stock run capacitor is plenty and having too much boost can overheat the compressor. 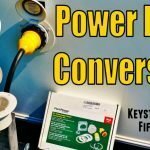 There is another style hard start kit which uses a relay instead of a PCTR to accomplish the task, but I chose the PTCR device type because that is what is included in AirXcel’s OEM hard start kit. The research and finding the right part was the hard part. 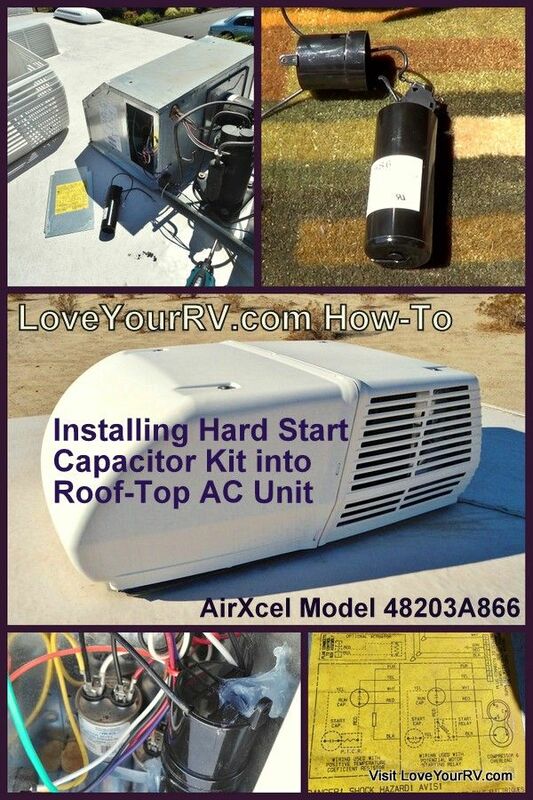 Installing the hard start capacitor into my RV air conditioner was super easy! 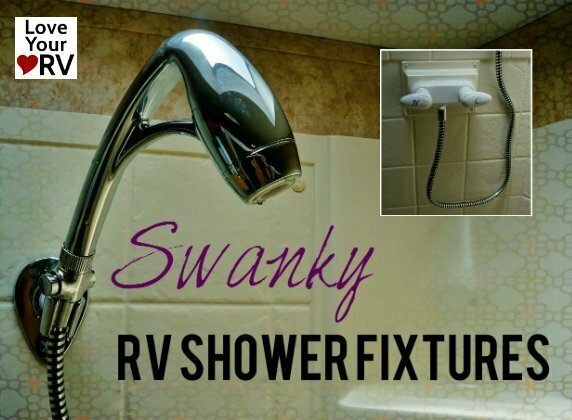 All you need is a Philips screwdriver and the ability to get up on the RV’s roof. 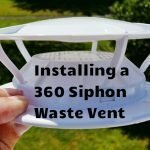 I also used a couple of zip ties and a few dollops of clear silicone adhesive. First, remove the plastic protective cover to expose the air conditioner. The connectors should just clip on to some extra lugs on the run capacitor. After you get the electrical connection completed then all that is left is to mount the hard start capacitor. I decide on mine to use clear silicone adhesive to hold the capacitor in place and did up the wires with a few zip ties. Electrical shock hazard! Before working on the AC unit make sure all power to it is disconnected. It’s hard to say early on. The compressor does sound like it is starting a little easier. 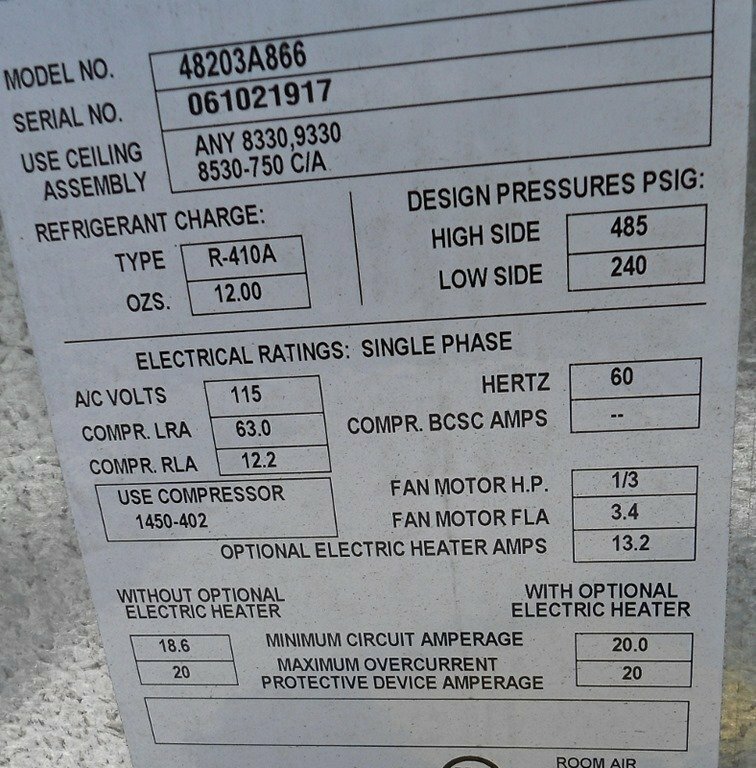 To really know I’m going to have to be in a very hot humid environment where the compressor draws its max current on my pair of Champion Generators and see how they perform. I plan on doing some tests and update this article with my findings. First I want to see if now I can get the AC to run with only one of the 2000w generators without it overloading. 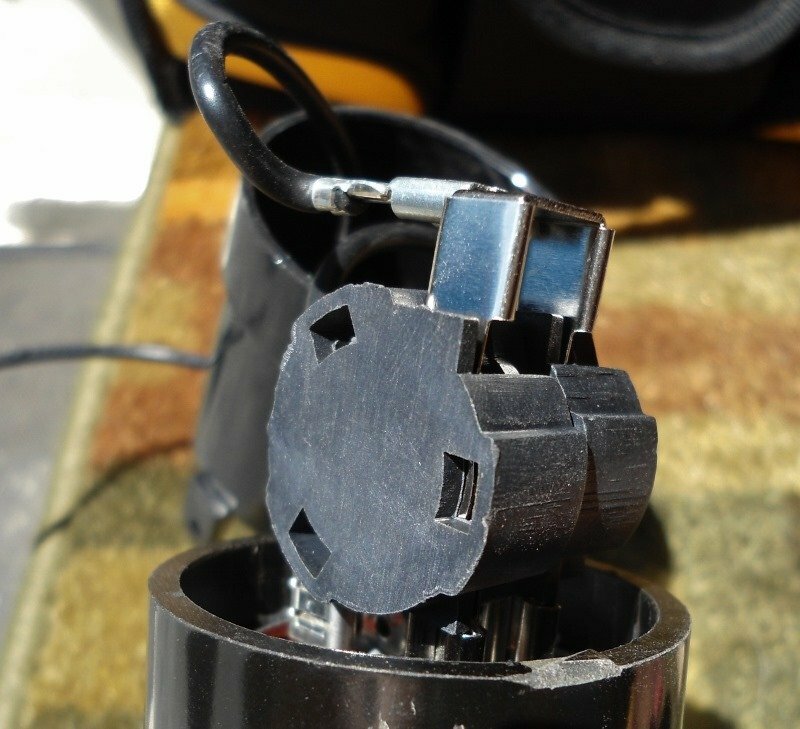 I could never do that before, not surprisingly as the minimum amperage my model of AC calls for is 18.6 amps which is right near the 2000 watt surge capacity and way above the 1600 watts continuous capacity of my Champions. Even if it does run it won’t really be practical to use it but it’s a good test. 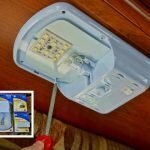 I guess having the hard start kit will help the AC run a little easier in those RV Parks with sketchy electrical prone to low voltage. 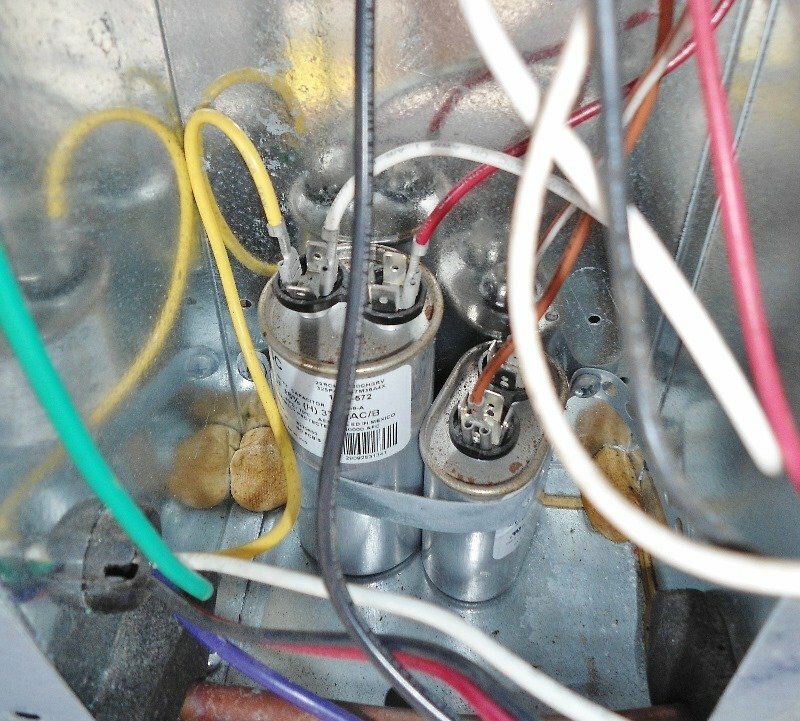 I read low voltage can be hard on the compressor and even damage it and is one of the reasons listed to install the kit. 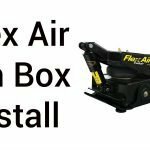 If you have a generator that is running your AirXcel 13,000 BTU AC but prone to overloading easily it might be worth looking into installing the hard start kit. 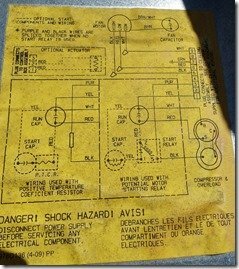 I’ve read about guys having good luck running 2000w to 2400w generators that would not work properly prior to the install.